Remembering Hazen Schumacher, host of "Jazz Revisited"
Sad news for jazz lovers this weekend. Radio legend Hazen Schumacher died yesterday at the age of 88. The Michigan broadcaster was known nationally as host of the "Jazz Revisited" program. Hear how Hazen Schumacher introduced a generation of listeners to jazz. Schumacher was on the air for more than 30 years, and his show introduced a generation to jazz. Back in the 1960s, Schumacher was working at the local radio station at the University of Michigan. And he wanted to create a program that would reintroduce people to the music he felt like audiences had largely forgotten: a very specific era of great, classic jazz recorded between 1917 and 1947. "Someone has called the programs an audio time capsule from that period, which is maybe a pretty good description,” Schumacher said in recent German documentary about the show. Now maybe this doesn't sound like a recipe for mass commercial success. But it really took off. "National Public Radio came along and it went national,” Schumacher says in the documentary. “So then we would get records from all over the country." For a generation of music lovers, Hazen Schumacher gave them one of their first introductions to jazz. "That show, Jazz Revisited, knitted the nation together in music appreciation,” says Linda Yohn, the music director at WEMU and a longtime jazz radio host. She grew up listening to Schumacher’s program as kid in Ohio. When she moved to Michigan, meeting Schumacher was one of the first things she wanted to do. Yohn remembers wearing a “Jazz Revisited” commemorative sweatshirt when she went hiking through some of the national parks out west, and says it felt like every person she bumped into wanted to tell her their story of growing up listening to the same show. "And he had such a way of meticulously putting these pieces together, and telling you the story and teaching you, yet doing it with such humor and he was so relaxed and friendly about it that you'd couldn't help but learn to love your grandparent's music,” Yohn says. Eventually the audience went international. "People from around the world would contact Hazen with the most obscure questions about the dawn of the genre,” says Scott Westerman, who grew up in Schumacher’s neighborhood. 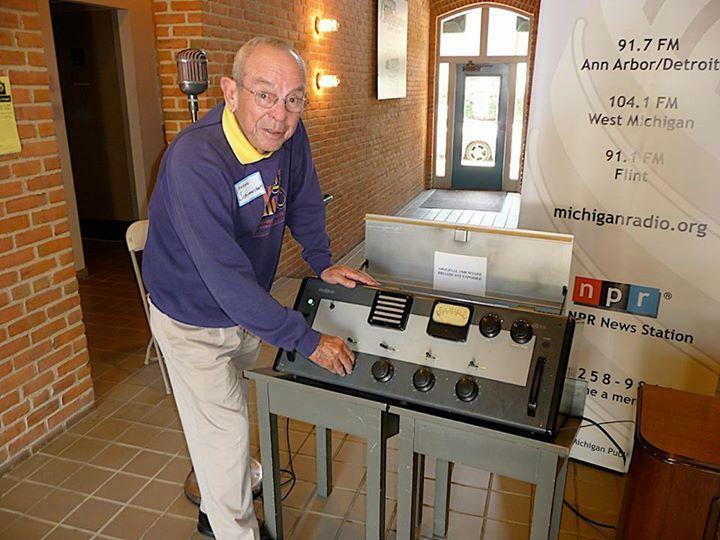 Westerman went on to work in radio and TV in Michigan for years. But he says he got his first job at age 13, running to get records for Schumacher from the radio’s extensive library. "Hazen believed that jazz was really the one true American contribution to the world at that time. It's uniquely American." After the show ended, a German jazz museum collected all the recordings of Schumacher's shows – more than 1,500 of them. Schumacher went on to be the director of broadcasting at WUOM. He also taught music and broadcast students at the University of Michigan. He's survived by his wife, Rusty, and their four adult children. DETROIT (AP) - Marcus Belgrave, a jazz trumpeter who graced stages and studios with Ray Charles, Aretha Franklin, Dizzy Gillespie, Joe Cocker and Motown artists galore, has died. He was 78. The 35th annual Detroit Jazz Festival is this Labor Day weekend. It is the largest free jazz festival in the world, and it will be held in downtown Detroit at Campus Martius and Hart Plaza. Chris Collins, the artistic director, and Jim Gallert, jazz broadcaster, writer and researcher, joined Stateside today to talk about the history of this festival and of jazz in Detroit. “The Detroit Jazz Festival celebrates not only the greater jazz landscape, but, in particular, this amazing legacy of the city of Detroit,” Collins said. Detroit came into the jazz scene in the early 1920s. Gallert said Detroit was an important feeder city. A lot of Detroit bands set the style for bands in New York. “Many of us think of Detroit as the New Orleans of the north,” Gallert said. The Detroit Jazz Festival is a year round effort to spread the gospel of jazz and support jazz artists. They work with students in Detroit Public Schools in what is called the "Jazz Infusion" where professional jazz artists work with the students to teach jazz, form bands, and put on shows. The Detroit Jazz Festival runs this Labor Day weekend in downtown Detroit. You can get schedules, artists and all the information at their website. *Listen to the full interview with Chris Collins and Jim Gallert on Stateside at 3:00 pm. Audio for this story will be added by 4:30 pm.